You are a spaceship captain with a mission to explore new worlds and recover precious resources before other enterprising spaceship captains do the same! In Jump Gate, the players race to explore and claim resources on distant planets. Competition is fierce and victory goes to the spaceship captain who is the best at managing their card hand and knowing when to take advantages of opportunities when presented. Each player will have to watch their actions, however, as the very act of stripping a planet of resource material can create a negative effect that could doom all the players and end the game abruptly. This is fast and light game with easy rules, surprising depth, strategy, and tactics. Jump Gate is comprised of 1 Jump Gate board and 1 Black Hole board, 12 Planet boards, 4 Action Reference cards, 48 Resource cards, 48 NavComp cards, 6 Spacheships (in one of six different colors), and Marking chips (a group in each different color). The game components are solid, durable, and colorful. A top quality release for an independent game if ever there was one. Note that while each piece of the game is rather small, you will be required to have a large space to play the game. Any kitchen table should be able to handle the playing area requirements, however. The game comes with a number of bits that need to be briefly introduced before we get into the game summary or you will quickly get lost. The Spaceship and Marker chips represent specific player locations, influence, ownership, and activity on planets and the universe. The Jump Gate board is the starting position of all players as well as a location spot for extra points during the end of the game. The Black Hole board represents the negative karma of the player’s actions of stripping resources from planets and collects Markers much like the Jump Gate board. While the Jump Gate provides the players with extra points at the end of the game, the Black Hole grows and eventually ends the game, penalizing the players when calculating the final score. Planet boards provide landing spots for the spaceships and are the only way a player can get Resource cards. Players can travel to adjacent planets or use the Jump Gate to travel to any planet instantly. All Planet boards have a Jump, Scan, and Land & Claim value. The NavComp cards have up to 3 numbers and provide “codes” that must be used to activity the Jump Gate, scan a planet, or land. NacComp cards will be the primary focus of the players throughout the game. 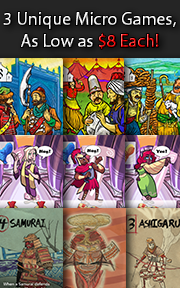 Some of the NavComp cards also provide the player with special abilities during the game. The Resource cards represent important materials needed for space travel as well as special locations, or even nothing at all. The goal is to collect as many resources as possible, but not blindly. The players gain more points by completing set completions of resources. However, when a player claims a Resource card, a Marker might be added to the Black Hole board if the Resource card has the Black Hole icon on it (see following image). The more Markers on the Black Hole, the closer the game is to ending. As a spaceship pilot, the players will be moving from planet to planet, scanning for resources, and landing to claim territory. This is all done through the use of their NavComp cards which will provide number values with colored shapes. These values and shapes are matched to an action that can be taken on the Planet boards. Specifically, Jump, Scan, and Landing. If the player does not have a NavComp card that has a matching number and shape, they are not able to take the action specified. Luckily for the players, the NavComp cards provide more than one value per card. To set up the game, set the Jump Gate and the Black Hole board in the middle of the table. Randomly select 8 of the 12 Planet boards and place them in a circle so the Jump Gate and the Black Hole boards are in the middle of the Planet boards. Next, shuffle the Resource and NavComp decks. Deal each player 1 Resource card face-up (if the card dealt is a “Famous Find” or “Nothing”, redeal to that player) and 5 NavComp cards face-down. The players should keep their NavComp cards secret but all Resource cards are played face-up in front of their owning player and visible to the other players at all times. The NavComp deck should be placed, face-down, within easy reach of all players and have enough room for a discard pile. 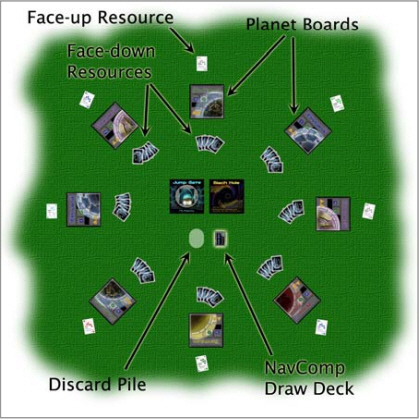 Lastly, deal 1 face-up Resource card to each of the 8 planets and deal the rest face-down. A planet may have more or less Resource cards than the other planets around it. While someone is setting up the play space, have another player give each player 1 Spaceship and Marker chips of the same color. Place all the Spaceships on the Jump Gate board; the Marker chips stay with the players for now. The only other items you will need will be a pen or pencil and a pad of paper to keep track of the final score. All done! <phew!> Determine who should go first and begin play! Turns are taken in player order around the table until the game ends. On their turn, a player can take up to 2 actions in any order they like and can take the same action twice. In total, there are 13 actions a player can take. Research allows the player to refill their NavComp hand, after discarding as many cards as they like, to a total of 5 NavComp cards. 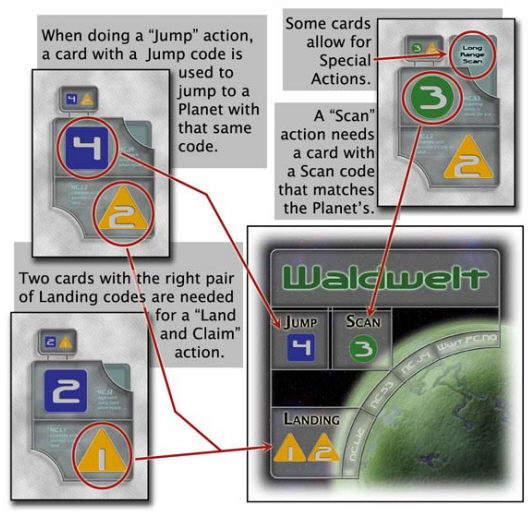 Jump allows the player, at cost of a NavComp card with a Jump value that matches the Planet board, to instantly travel to that planet from anywhere. One Marker is added to the Jump Gate board. Fly allows the player to move from one planet to an adjacent planet at no cost of a NavComp card. Scan allows the player, at cost of a NacComp card with a Scan value that matches the Planet board, to reveal 1 face-down Resource card. The player must be currently located at the same planet they scan. Land & Claim allows the player, at cost of two NavComp cards with a combined Land value that matches the Planet board, to claim the planet as their own. All Resource cards are revealed and taken first by the player who claimed the planet and then by any player who has scanned the planet, per Marker. An unclaimed Resources remain. A planet can only be claimed once. Harvest allows the player to collect 1 Resource card of their choice at a claimed planet they are currently located at. The player need not be the owner of the planet. Additionally, there are 7 special actions. To take these actions, the player must discard the NavComp card of the same name. All special abilities play off the six universal actions. Backroom Deal allows the player to harvest 2 face-up Resource cards from a claimed planet they are currently located at or 1 face-up Resource card from any claimed planet. Hotshot Pilot allows the player to complete the Land & Claim action with only 1 NavComp card. Inside Info allows the player to refill their hand to up to 5 cards and then take 1 extra turn. Jump Paradox allows the player to swap the location of their spaceship with another player’s spaceship. No markers are placed on the Jump Gate. Long Range Scan allows the player to Scan any planet. Lost Records allows the player to remove 1 Marker from either the Jump Gate or Black Hole. Wormhole allows the player to move to any planet without using the Jump Gate. A marker is not placed on the Jump Gate. If either of the two conditions (or both) are present at the end of the player’s turn, get ready for some number crunching as the actions of the players throughout the game have influenced the final score! Black Hole Penalty: This only happens if the Black Hole ended the game or both end game conditions occur simultaneously at the end of a player’s turn. The player with the most Markers on the Black Hole board must discard a variable number of Resource cards. The number discarded is based on the number of players in the game. If two or more players tie for the most Markers, they all lose Resource cards. Jump Gate Bonus: the player with the most Markers on the Jump Gate is awarded 5 points. If two or more players tie for the most Markers, they all gain 5 points. Scan Scoring: each player is awarded 1 point for every Scan marker they have placed on a Planet board. Players also score points based on the Resource cards they have collected. Gems: player gains points equal to the number of Gem Resource cards they have collected multiplied by the number in the player’s largest set of the same-colored gems. EnerGel: player gains points by collecting a set of 1 Dark and 1 Light EnerGel for 7 points per pair. Any remaining EnerGel cards not paired award 2 points each. Water: player gains points based on the number of Water cards collected. Possible points include as low as 1 or as much as 32 points. Famous Finds: player gains 5 points per Famous Find card. The winner of the game is the player with the most points. There’s already more than enough game to play and enjoy, but there are several game variants also provided. Download a copy of the game rules for more details on the summary I have provided. I’ve been chompin’ at the bit to play a space themed game with my little geeks. I took out Battleship Galaxies the other day and we did nothing more than play with the miniatures for a good hour all in hopes of wetting their appetite. This tactic worked brilliantly and all I had to do is mention “space” and “game” in the same sentence and my little geeks were jumping up and down! 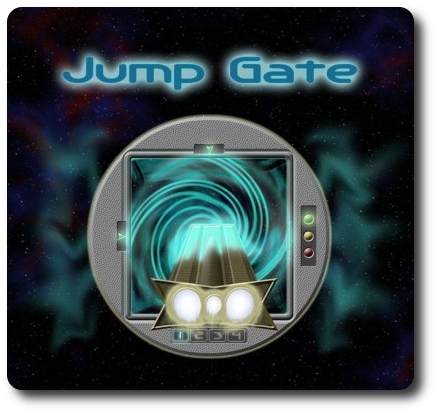 I think Jump Gate will really appeal to my little geeks for three reasons. First, the game is light and the objective is very clear. Second, the game gives the players a lot of choices in what actions they want to take without being overwhelming. In some cases, you will only be able to take 1 or 2 actions because of your cards. Third, the theme is a great deal of fun! Travel around the galaxy exploring planets! My little geeks have never had a game experience or theme like this before and I am really excited for them. From a Parent Geek perspective, I am eager to introduce a game where set collecting is a bit more complex and much more meaningful. We have played games in the past were set collecting was part of the game play (Go Fish and Seven, for example), but “what” they collected and how did not change the outcome of points. This will bring a whole new dynamic to the game and really make my little geeks think about what they need to collect and why. The rule in the game where all the collected Resource cards are visible is a real boon here. My little geeks can see everything I’m collecting and ask me question. I, in turn, can help my little geeks make better choices, too, as I can review with them what they have collected so far. I explained the rules to my little geeks and how the cards worked. Provided several examples of using the cards to move around the game space and how collecting sets of cards made a big difference in points. There were a number of questions about all the actions they could take, especially the special abilities. As such, we opted to not play with the special abilities for the first game and just focus on the universal actions. This made my oldest little geek feel much better. My younger little geek decided to go play LEGOs with his younger brother instead of playing. Turns out that all the talk of spaceship made him want to go build one himself! And so, as I set up the board for a 2-player game and dealt the cards. While doing so, I asked my little geek his thoughts on the game. Man, I love my son. What a wonderful game! It plays light as far as rules go, but there is so very much to do that if plays like a heavier game without feeling heavy. Put another way, the game has some serious depth to it while never drowning the player in complexity. It is for this reason, I think the game would work very well as a family game and as an elitist game, too. I would even go so far as to strongly suggest that Jump Gate would be an outstanding “gateway” game for non-gamers and new gamers, alike! My oldest little geek loved Jump Gate. He told me after the first game that he wanted to play another one right away! This was after almost an hours worth of play and he wanted to jump right back into it. Speaking of game length, this might be the biggest hurdle for your little geeks. An hours worth of sitting down at the table can be very hard to do for a little body full of energy. If your child is easily distracted, but still wants to play the game, simply leave the game table for a bit. This is what we did and there was never any problems getting right back into the game. All the possible points and the game state is easily preserved which allows for brief breaks outside, lunch, playtime, or even playing the game over a span of several days if need be. 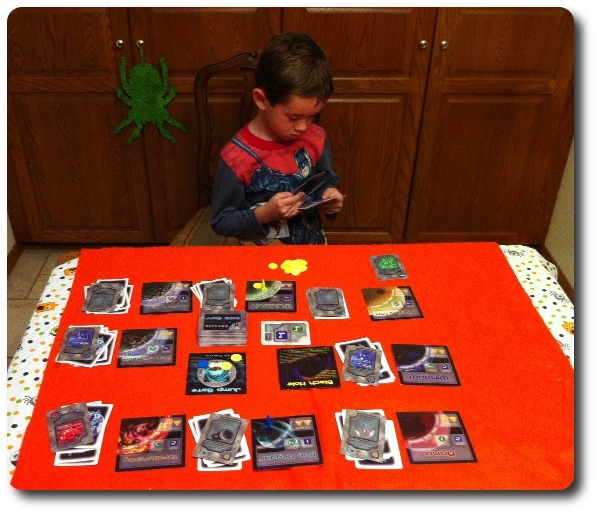 My little geek really did a great job playing the game – look how serious he is! Gamer Geeks, you are going to enjoy this light game that plays fast but provides all the choices and actions of a game that is usually much, much heavier. There is a great deal to do and how you go about it provides the more advanced player a great deal of strategy and tactics to think about. The set collecting element should appeal to you and the game becomes a race for finding and then snatching resources before your opponent does. Parent Geeks, this is a fantastic family game you will want to play again and again with your family, friends, and little geeks. If you have non-gamer friends, they will enjoy this game, too. The theme is great, the rules are easy to understand, and the game play is fast. A great game to play at the family gaming table or anytime you want a fun and fast space exploration experience. You will also enjoy how much thinking your little geeks will need to do to play the game. The game provides a great opportunity to strengthen the reading, counting, and logical thinking geek skills. Child Geeks, you should expect be challenged and rewarded, but only if you can put the time in. Yes, the game can be an hours worth of your time, but it will be so worth it. You get to pilot your own spaceship and explore strange alien planets. You can even land on them and claim them as your own! Name them whatever you want! Best of all, you get to do so much in the game! You’ll be sitting at the big table with the adults and making important choices and have a great feeling of accomplishment when your turn is over. I really, really like this game. 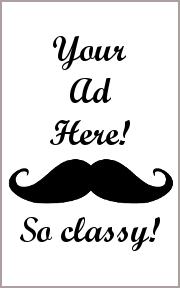 It provides a fun experience with great depth without making you feel overburdened. I’ve played many heavier games that use the same type of mechanics that Jump Gate does, but they were not nearly as satisfying as this game is. I believe this is because of the speed in which the game is played and all the actions you can take. I never felt limited or pushed to make any choices. In fact, the entire time I played the game, I was very much aware that I was really enjoying what I was attempting to do to influence the final score and had more than enough time to correct any mistakes I might have made. Wonderful! In summary, Jump Gate is a wonderful game that plays light but provides a heavier game experience without feeling heavy or difficult. Few games can provide this level of play and experience without demanding a great deal from the player or falling short on the “fun scale”. I would highly recommend Jump Gate to friends, family, game elitist, and the occasional light gamer. Tagged Father Geek Approved, Gamer Geek Approved, Parent Geek Approved. Bookmark the permalink. Excellent review. To me it sounds interesting, but have to see what the little one in our household thinks. Her limit is about 30-45 minutes right now. More than that and it’s time for her to dance. You make a very good point, sir. The amount of time a child can spend on a game is much less than an adult and is also based on the child’s temperament. I am exceedingly lucky that my oldest really enjoys games and can play longer games. But the length of game he can play also depends on the type of day he’s had. When I play with my little geeks, we take breaks. We’ll go outside and play, go get a snack, play with some LEGOs, and other activities. Little minds can get burned out a lot faster than the more disciplined mind of an adult. This is especially true if the little geek has Attention Deficit Disorder or is simply getting tired. Try taking a break or play shorter games. There is simply nothing stopping you from doing so. The point is to have fun and interact with each other. If it isn’t fun, stop playing. There will always be time later to play games. There are many, many activities you can do with your child and have just as much fun and be as rewarding. Rome wasn’t built in a day and neither is a Geek! Great review Father Geek!! Glad you and your little geek enjoyed it so much. Another way to simplify and speed up the game when playing with younger space explorers is to not include the Black Hole … leave the BH board in the box and ignore the icon on the resource cards. Now, this does remove one of the cooler mechanisms in the full game, imo, but usually there is enough to do for a younger player to keep the game fun without it. This is essentially what Schmidt Spiele has done (along with changes to the scanning rule) for their re-working of the game under the title “Space Mission”, which will be on display at Essen this year. One other minor point about playing with the Black Hole board: You only lose resources if the game was ended by 9 chips getting on the board. If the game ends through depletion of non-BH resources at the planets, then no one loses resources. The mechanism is meant to be used as a “governor” on fast-expanders … and as a way for players who may be behind to threaten the leaders, who usually have more chips on the BH board. Remove the Black Hole?! NEVER! As you said, it is one of the cooler game mechanisms. You bring up an excellent point about the Black Hole only removing Resources if nine Markers are added, though. I’ve updated the rules summary (both here and on BGG) to include this important point! Great game, Matt! Keep up the great work!